John Brenkus says "We Own Work." How does Ford say ‘We Own Work’? See how much weight the high-strength steel frame on the all-new 2017 Super Duty can support. Ford Super Duty has long been a go-to choice for anyone who needs a heavy-duty truck, and the 2017 Super Duty is the toughest, smartest and most capable version yet. 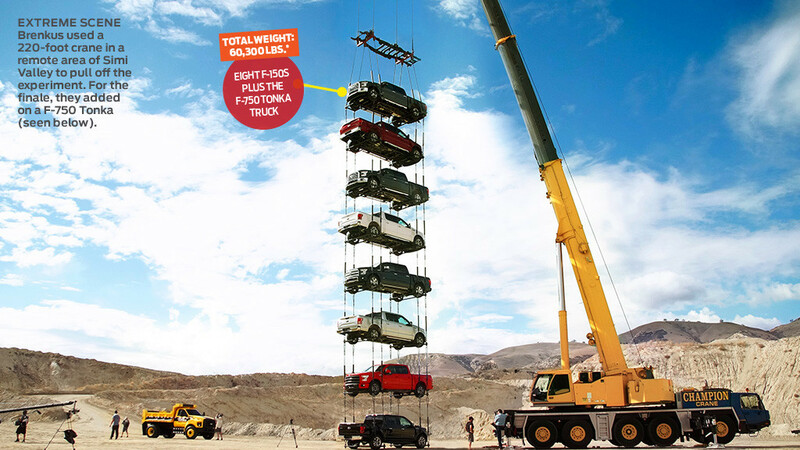 To demonstrate this, Ford engineers wanted to put it to the ultimate test. So they brought in ESPN Sport Science creator and host John Brenkus—a man who’s gauged the performance of All-Pro athletes in more than 1,000 segments on his show. “We put the best athletes in the world through the wringer on ESPN, and we wanted to do the same with the Super Duty,” he says. This challenge turned into a dramatic episode for Ford’s Tough Science video series, in which Brenkus puts various trucks through vigorous trials, such as pummeling them with high-speed projectiles and driving them over mountains of lumber. The frame—basically the backbone of the truck—is designed to support the rest of the vehicle and its load, but the toughest Super Duty ever was capable of a lot more than that. Brenkus says he was more nervous about high winds affecting the crane than the frame’s ability to handle the astounding payload. “There was no bending, no stress—it just did its job like no other truck can,” he says.